Microsoft has announced the second #Insiders4Good fellowship program in Africa. The fellowship is now opened to citizens of East Africa. Bambo Sofola, Director of Engineering at Microsoft announced the fellowship on stage during the keynote session of NexTech Africa. 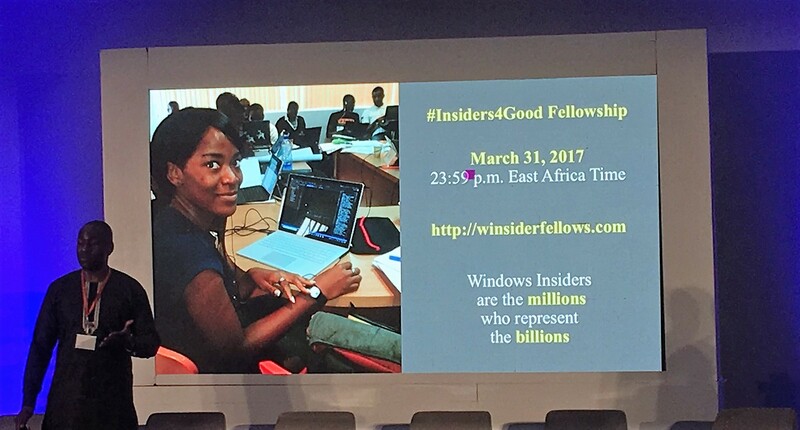 This is an expansion of the Insiders4Good initiative of the Windows Insiders program launched in Lagos last year. The fellowship will be in partnership with Growth Africa. The fellowship program is opened today to citizens of Kenya, Rwanda, Tanzania, and Uganda with innovative and creative ideas. At the end of March 25 fellows will be selected for the program. The program will see Microsoft supporting them with technical mentorship, business guidance, software and open them up to a global network. We are looking for entrepreneurs like you problem-solvers who think deeply about the issues confronting their communities, visionaries who create solutions that could address these issues, and leaders that grow opportunities for their solutions to thrive in the market. Your work improves the lives of your fellow East Africans and has the potential to impact the world. So if you believe that’s you head out to the page and apply. Click to apply for the #Insiders4Good Fellowship Program. For the full terms and conditions of the program kindly visit here. Deadline for submission of applications is 31st March 2017.